I asked a question the other day about the leaves on my squash and cucumber plants, but the answer I got was that I had blossom rot - which was WRONG. The vegetables are fine, and the blossoms are falling off the way they should. My question was about the discoloration of the LEAVES. 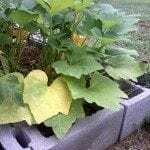 Will the yellowing of the leaves affect the fruits and vegetables? I've been growing veggies for awhile, and this has never been a problem for me. We are answering lots of garden questions this time of year. Yellowing leaves usually indicate a watering issue. Either to much or to little. If the soil is dry you may need to water even twice a day, especially if the summer temperatures are above 85 degrees. There could be other reasons including insects or fungus.